Long used to boost head-to-toe wellness in ayurveda (the traditional medicine of India), triphala is now touted as a natural solution for a variety of conditions. A blend of three fruits, triphala contains amla (Emblica officinalis), myrobalan (Terminalia chebula), and belleric myrobalan (Terminalia belerica). Triphala is available in powder, juice, and tablet form. An oil containing triphala is sometimes used topically on the scalp and hair. According to proponents, triphala can improve liver and gallbladder function, boost immunity, ease inflammation, and manage chronic conditions like acne and irritable bowel syndrome (IBS). Although some practitioners of ayurveda suggest that triphala can cleanse the system (partly by acting as a gentle laxative), there's no clinical-trial-based evidence that the formula can act as a detox or weight loss supplement. Several studies suggest that using a mouthwash containing triphala can help to reduce plaque formation and gingivitis. In a study published in the Journal of Periodontology in 2016, for instance, people with chronic gingivitis were asked to rinse with a triphala mouthwash, a standard mouthwash (containing chlorhexidine), or a placebo mouthwash twice daily for 60 days. While people in all groups had a reduction in plaque, gingivitis, and oral bacteria, those using the triphala or the standard mouthwash had a greater reduction than those using the placebo mouthwash. In animal research, scientists have shown that the herbal blend may help keep cholesterol in check. In a preliminary study published in Alternative Therapies in Health and Medicine in 2012, for instance, researchers found that animals fed a high-fat diet supplemented with triphala had a reduction in body weight and body fat and lower total cholesterol, triglycerides, and LDL cholesterol compared to those who weren't given the triphala. Considered a gentle laxative, triphala is often used to stimulate digestive health and ease constipation. So far, scientific support for the laxative effects of triphala is lacking. 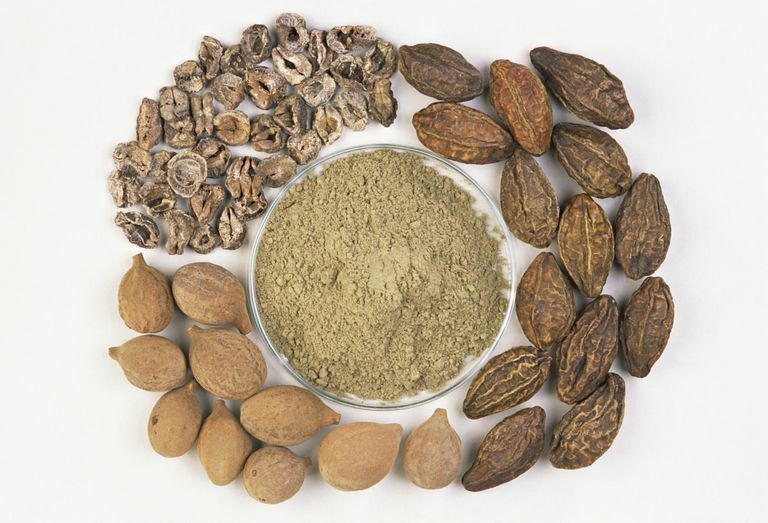 In preliminary studies on animals, triphala has demonstrated anti-cancer effects. A report published in 2008, for instance, found that feeding triphala to mice helped suppress the growth of pancreatic cancer cells. Further studies are needed. In some cases, triphala may trigger gastrointestinal side effects such as gas, stomach upset, and diarrhea. Triphala supplements haven't been tested for safety. It's important to note that, due to the fact that dietary supplements are largely unregulated, the content of some triphala products may differ from what is specified on the product label. In some cases, the product may deliver doses that differ from the specified amount for each herb. In other cases, the product may be contaminated with other substances such as lead and other metals. While consumers face such risks when purchasing any dietary supplement, these risks may be of greater magnitude in the purchase of ayurvedic products containing a variety of substances in varying doses. In addition, the safety of supplements in pregnant women, nursing mothers, children, and those with medical conditions or who are taking medications has not been established. You can get tips on using supplements here, but if you're considering the use of triphala, talk with your primary care provider first. Gurjar S, Pal A, Kapur S. Triphala and its constituents ameliorate visceral adiposity from a high-fat diet in mice with diet-induced obesity. Altern Ther Health Med. 2012 Nov-Dec;18(6):38-45. Pradeep AR, Suke DK, Martande SS, Singh SP, Nagpal K, Naik SB. Triphala, a New Herbal Mouthwash for the Treatment of Gingivitis: A Randomized Controlled Clinical Trial. J Periodontol. 2016 Nov;87(11):1352-1359.